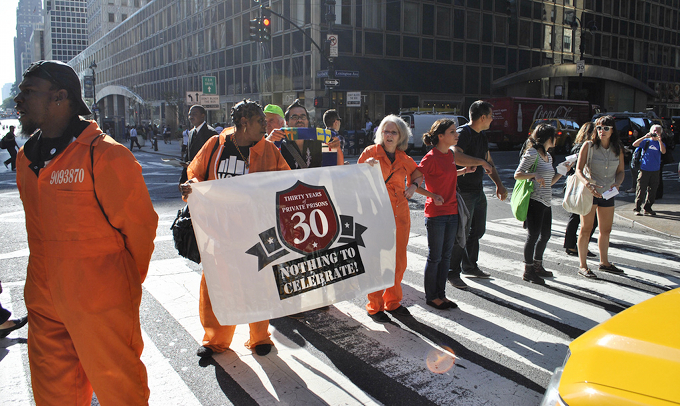 A 2013 New York City protest against private prisons. The crime rate has gone down since then, but the private prison business is booming, in part because of the white supremacist Trump regime’s ICE roundups sending many more people to private immigration slammers. The private prison business buys politicians on both sides of the US partisan divide. Photo by VOCAL-NY. It’s not just a lack of imagination. It’s not just a fawning attitude. It’s not just the absence of patriotism. President Varela’s decision to put out the maintenance of a new prison in Chiriquí for bids by private contractors is, to be sure all of those things. But most importantly, and coming from a guy who took millions from Odebrecht and then lied to us about it, it’s a structural incentive for corruption. Oh, sure. It might be said that what is intended here is not like in Jim Crow, where after slaves were formally freed a Southern police state railroaded blacks through the criminal justice system and into a system of “convict leasing” in which plantation owners used convict labor instead of slave labor, with little practical difference between the two things. It might be said that this is not like the US system of manufacturing that undercuts both union labor and minimum wage by paying prisoners pennies an hour to do assembly work. It might be said that this is not quite like the completely privatized immigration prisons that Donald Trump is stuffing past capacity with roundups not only of people in the United States illegally, but also of citizens and legal immigrants who come under suspicion for having brown skin or being heard speaking Spanish. ‘White supremacist? Who, ME?’ the president and members of his brain trust may protest. But at the end of the day, any private company performing any task in Panama’s prison system sees its profits go up when more people get sent to prison. It’s a powerful incentive to prevail upon police, prosecutors and judges to send more people to prison, whether or not there is any justice or wisdom in that. In the United States there are judges serving long prison sentences for selling youths who did little or nothing to private juvenile detention centers. Those are the arrogant ones who were caught taking millions in bribes to do this. It would be naive to think that the practice isn’t far more widespread. President Varela proposes to copy something truly awful from the US system. Panamanians ought to question his wisdom, his ethics and his patriotism for doing this.